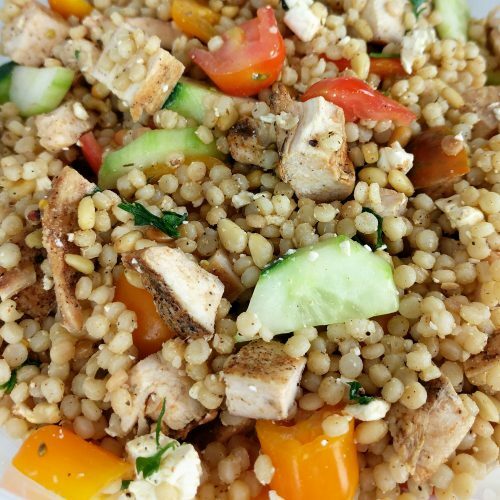 This Mediterranean Salad is perfect for those hot summer days. 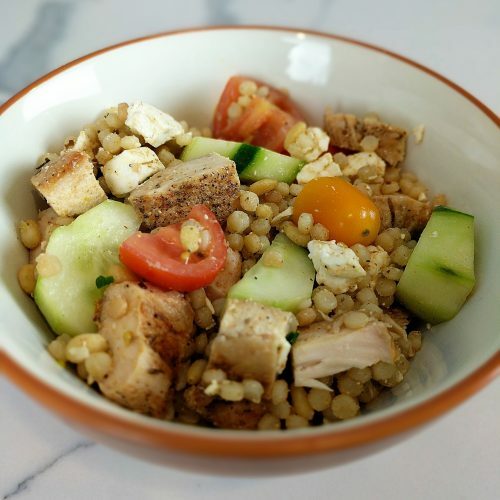 It is filled with cucumbers, tomatoes, feta, fresh herbs and chicken and is held together by light and fluffy couscous. Last week I went out to lunch at Luna Grill with some old co-workers. One of them ordered the Mediterranean salad and I was so jealous! It looked phenomenal!! I immediately thought, I should try to make this! This delicious salad has 425 calories, 32g carbs, 12g fat, 560mg sodium and 45g of protein (not including dressing). Lets compare that to Luna Grill. Luna Grill’s Mediterranean Chicken Salad has 460 calories, 56g carbs, 13g fat, 800mg sodium and 33g protein (not including dressing). Overall the stats on Luna Grill’s salad isn’t too bad compared to previous comparisons I have done. The cals, carbs and sodium are significantly higher, while the protein is lower (which is not good). You are still better off making this yourself BUT I have to admit, Luna has some pretty decent stats for “fast food”. 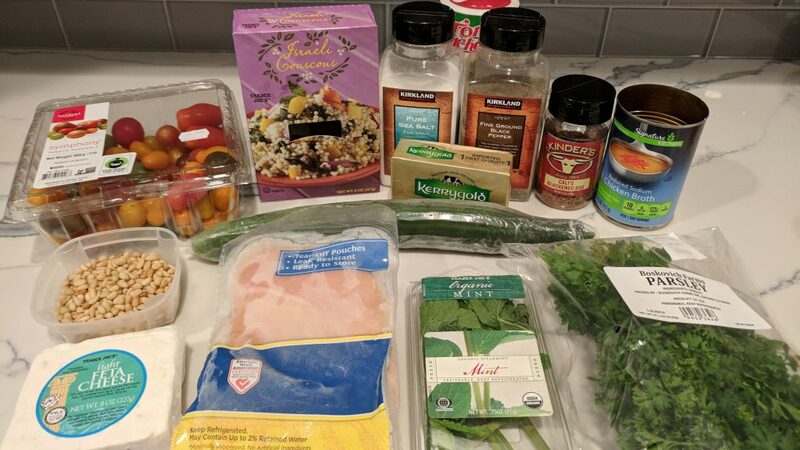 If you are gluten-free simply swap out the couscous for Quinoa and you are ready to rock and roll. For Vegetarians, omit the chicken and use vegetable broth instead of chicken broth when cooking the couscous. Bada bing, badda boom! This is a dish best served cold! It is salad after all, but I just wanted to stress that to avoid confusion. Feel free to add more Mediterranean flavors such as kalamata olives and raw onion to your salad. I do not like either of those, so I didn’t include them in my recipe. I buy my grape tomatoes at Costco (photo below) but you can buy them at any market. I like to buy the mixed colors to liven up the dish a bit. I buy my pignolias (pine nuts) already toasted from Trader Joe’s! 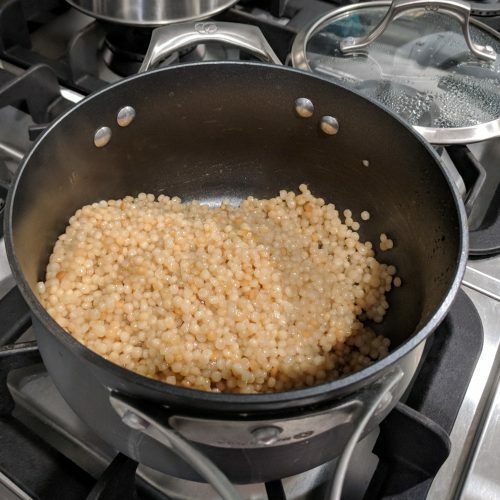 If you already have some that aren’t toasted, before you start cooking the couscous add a tbsp of grass fed butter to the pan, add pine nuts and continuously stir until light brown (about 1-2 minutes). Set aside. You can serve this recipe over a bed of romaine lettuce like Luna Grill does, if you so choose! Make your own lemon herb vinaigrette or drizzle with your favorite prepacked one, just watch the sodium and fat content. 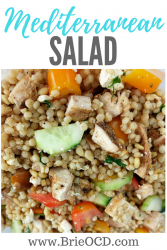 Hope you enjoy this Mediterranean Salad! 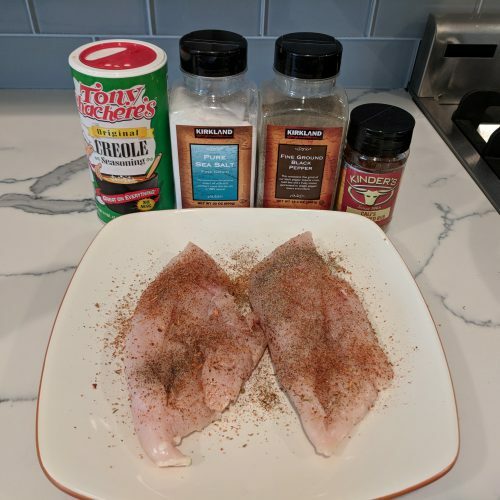 lightly season chicken breasts with salt, pepper, creole and blackened seasoning. place a grill pan over medium-high heat. lightly spray with cooking spray. add chicken to grill pan. cover and cook for about 15 minutes or until internal temperature reaches 165 degrees. flip halfway through. let cool and cube. 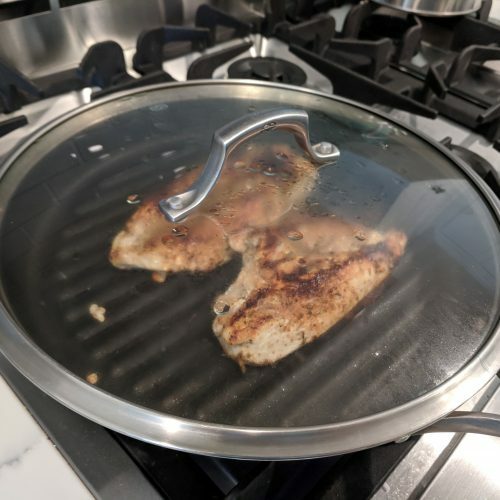 while chicken is cooking, prepare the couscous by melting the butter in a sauce pan over medium-low heat. add couscous and stir often until couscous browns slightly (approx 2-3 minutes). add the chicken broth & 1/2 tsp salt to the sauce pan, raise heat to high and bring to a boil. reduce heat to low, cover and simmer until the liquid is absorbed and couscous is tender (approx. 5-7 minutes). 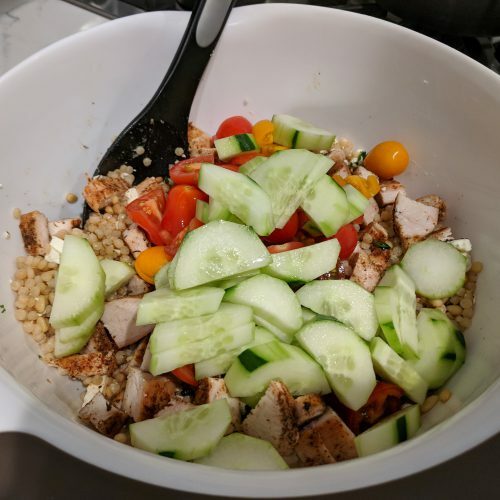 while chicken and couscous are cooking, cube feta, chop parsley and mint, slice cucumbers and tomatoes. 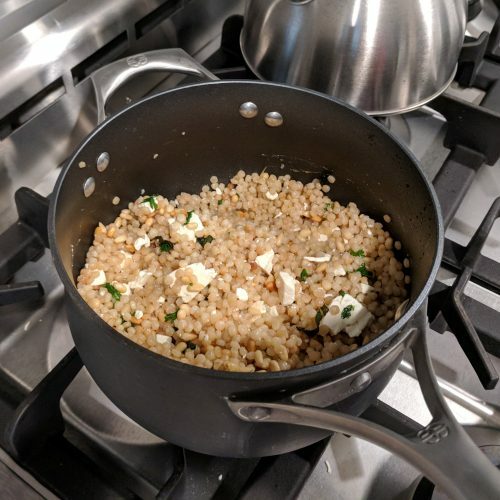 when couscous is done cooking, fold in pine nuts, feta, parsley and mint. 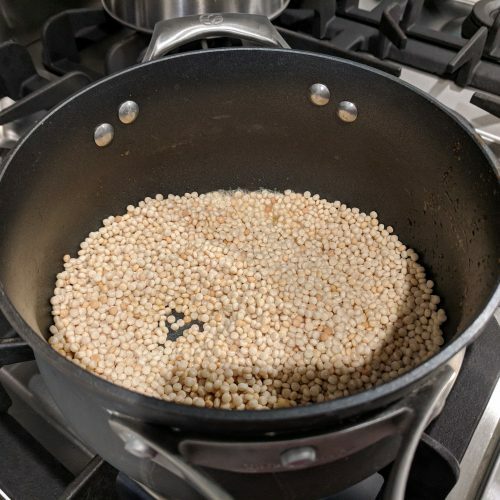 transfer couscous to a large mixing bowl or tupperware. 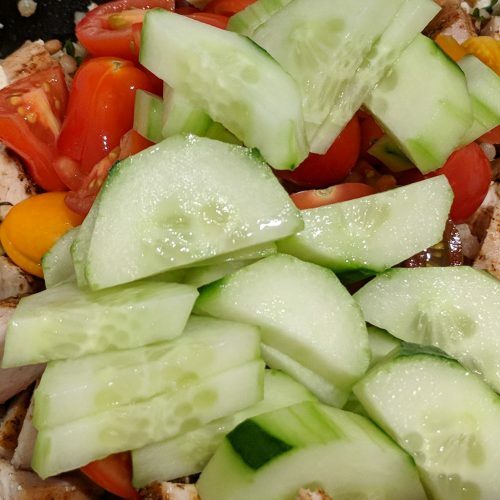 Add tomatoes, cucumber, pine nuts and cubed chicken. Stir. drizzle with your favorite lemon herb vinaigrette and enjoy!